This page tells the story of my journey learning to master reciprocal teaching. The strategy came highly recommended by ASCD (formerly the Association for Supervision and Curriculum Development) and so I stuck with teaching the process. At first, I thought that my students would never learn all the steps, but they did. I also didn’t think the students would ever run their own groups, but they did. Fortunately, I can report to you now that reciprocal teaching clicked in my classroom. It became a high-level-thinking, independent activity that students managed while I was teaching guided reading groups or conferring. I can overview an article to set my purpose for reading. I can divide a long article into smaller parts. I can read for different purposes: to find and figure out the meaning of vocabulary, to ask questions and find possible answers, to summarize small parts of texts. I can work with teammates to improve my reading skills. I can work with my team independently to complete a multi-step task following specific steps. Students work as teams of 4-5 to read a challenging article following an overview. They follow specific steps, each needing an introduction and practice. Download Reciprocal Teaching task card. A more thorough explanation of overviewing is on the connections page. Second, the team agrees how to divide the article into parts so they can digest small amounts of reading at a time. Nonfiction is easy. Readers usually divide it by subsection. For fiction, readers divide the text into chunks no longer than the width of their hands. Third, the team reads each part 3 times. In general, the overall process for reading each part is this: read it and talk, read it again and talk, read it a third time and talk. To be specific, the first time students read one section independently and silently to find unfamiliar vocabulary. With the help of one another, they talk about the words and figure out the meanings. They decide on a synonym and write the synonym over each tricky word they discuss. The second time through, they read that small part silently again. This time the students hash out what they don’t understand. They share their questions and talk until they figure out a potential answer. To show the teacher what they talked about, the participants underline the words that give them trouble and write a question mark in the margin. The third time, they read the same section silently again. After this third read, the team talks until they agree on a headline summary for that one part and writes it in the margin. Then, they work their way through each part of the rest of the selection, (1) figuring out unfamiliar words, (2) discussing their questions, and (3) writing a headline summary for each part. Teaching students to find out what they don’t know and asking their peers to help fill in the gaps is new to most students. It is such a dynamic shift from what they are used to: let’s read so that the teacher can ask us questions to see if we understand. Therefore, I find that these circles are more difficult to manage than I originally imagined and it takes me longer to remove myself from leading the circles. The good news is that we discuss vocabulary and ideas in more depth and more often than ever before. Sometimes my students want to talk about up to 20 words per selection! They also ask about words that I never would think to help them with, words like hold, cries, and bolted. Readers put their summarization skills to work again, also. Reading a section and figuring out main ideas is not something that comes easily. Yet, if students can master this strategy, it helps them (1) understand the texts and (2) take tests. If readers take the time to read deliberately and summarize, they understand the text better. When students summarize on their test papers, scoring better is just a matter of matching answers to key words in the margins. Again, it is a matter of slowing down, reading smaller chunks of text at a time, and working with a team to practice consistently. As students improve, they compete with one another to write the shortest headline summaries possible. 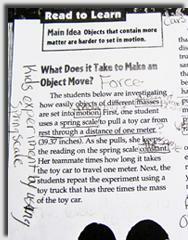 The summaries still hold the gist of basic information, i.e., force used to move objects. Or, Students balance cars using spring scale. In addition, asking questions becomes acceptable. Students admit what they don’t know because it is the expected thing to do. They are reading difficult content and need one another for support. I continue to look for ways to improve the circles based mostly on what my students tell me they need. As usual, they reflect at the end of the reading block by writing in their reading notebooks. One 5th-grade student writes, "I'm sitting in this group with these people but I still don't know how to talk about words and get help from my peers." While disheartening, I agree. I see a side-by-side mentality to reading in school. It is very similar to watching 3-year-olds play in a sandbox. The discussion is not within the group. The students wrangle for center stage. They look to me - rather than each other - for help. They act helpless. They speed through the task just to check it off a list. As a result, I continue to teach them how to talk to one another. I constantly remind them NOT to be quick to read unfamiliar words for one another but to offer strategies instead. I suggest they just wait and allow think time. Then, I hit on videotaping the circles so participants can analyze what works. The class sees they are operating alone and not as teams. With practice and self-evaluation and time, they improve. I also realize from videotaping myself when I lead a group that I allow students to rely on me to facilitate the discussion. Even when I try to bow out and let the kids control the conversation, I see that they constantly check my face for affirmation of what they are saying rather than turning to one another. I am too quick to solve problems that I know they can solve for themselves if I probe and give them time. What I like the most is that reciprocal teaching groups help me break down the size of my class. During reading time, four or five are at the reciprocal teaching table grappling with engaging work - independently. That leaves 5 with me and 15 working on other tasks. I feel like I have an assistant! In addition, even though I don’t have to run anything off, I still have a grade. When finished, I can evaluate the tracks of their thinking on their papers: the words and questions they discussed and the summaries they wrote in the margins. In essence, I also am preparing these kids for a real-life activity. The groups remind me of the study group my husband was a part of in his MBA program. Each week these executives grappled with difficult readings and math concepts. They met once a week to help one another understand the concepts before they went to class to hear the lecture. The groups came to value the assistance they could depend on from one another, but it took time and trust. I’m relieved my reading teams worked so well, but I can see why experts suggest starting reciprocal teaching groups in first grade. Directions in detail. You could use it as a poster. Directions fit on a card. Could be cut into separate cards. 71 percent of the students [who worked in reciprocal teaching groups] achieved criterion performance as opposed to 19 percent of the control students who were involved in individualized skill instruction.